Explore this Luscious Four-Layer Pumpkin Cake recipe. 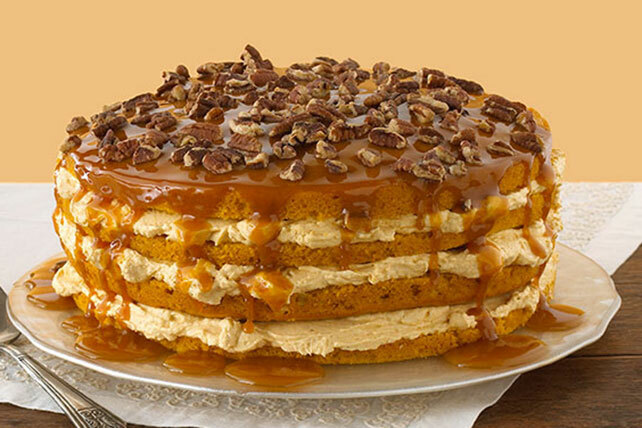 Bring together caramel, cream cheese and pecans in this Luscious Four-Layer Pumpkin Cake. Beat cake mix, 1 cup pumpkin, milk, oil, eggs and 1 tsp. spice in large bowl with mixer until blended. Pour into 2 greased and floured 9-inch round pans. Bake 28 to 30 min. or until toothpick inserted in centers comes out clean. Cool cakes in pans 10 min. Remove from pans to wire racks; cool completely. Beat cream cheese in medium bowl with mixer until creamy. Add sugar, remaining pumpkin and spice; mix well. Gently stir in COOL WHIP. Cut each cake layer horizontally in half with serrated knife; stack on serving plate, spreading COOL WHIP mixture between layers. (Do not frost top layer.) Drizzle with caramel topping just before serving; top with nuts. Ensure easy removal of cake layers by covering bottoms of cake pans with circles of parchment paper before filling with batter. Place 1 of the cooled cake layers on serving plate. Make 2-inch horizontal cut around side of cake, using long serrated knife. Cut all the way through cake layer to make 2 layers. Remove top layer by sliding it onto 9-inch round cardboard circle. Frost cake layer on plate with 1/3 of the COOL WHIP mixture. Slide top half of split cake layer from cardboard circle onto frosted layer on plate. Place the remaining unsplit cake layer on a cutting board. Cut into 2 layers as done for the first layer. Repeat process of transferring cake layers to stacked cake layers on plate using the cardboard circle. Omit caramel sauce. Microwave 10 KRAFT Caramels and 1 Tbsp. milk in microwaveable bowl on HIGH 2 min. or until caramels begin to melt. Stir until caramels are completely melted and sauce is well blended. Drizzle over cake just before serving; top with nuts.